Cassie Latshaw grew up in Bristow, Oklahoma on an exotic animal farm. Yes, an exotic animal farm. From the ripe age of five she started singing in vocal contests and Opry houses all over the United States. Singing and performing anything from classic country to musical theater show tunes. She was given the amazing opportunity to open for such big name artists as Ray Price, Jody Miller, Sammy Smith, and many more all before the age of twelve. 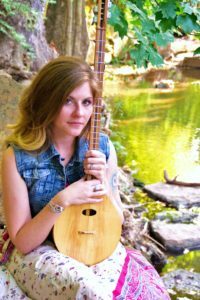 While drawing inspiration from Oklahoma’s own, Tom Skinner, Susan Herndon, and J.J. Cale into adulthood, her style of music has evolved into an Americana/folk feel, with heavy tones of classic country and blues. Red Dirt has always ran deep through this girl’s veins. With the help of my friends and chordstick, Guinevere, we are sure to bring a new song to your ears, and a smile to your face.